You probably rolled your eyes when Pepsi started making “craft” sodas, but it turns out, they’re actually really good, and Amazon will sell you a 12-can variety pack, or 12 “Original” cans for $10 when you use Subscribe & Save and clip the 30% coupon on the page. Those are easily the best prices we’ve ever seen, so order fast, then sip slow. Note: You won’t see the 30% discount until checkout. With 4GB of RAM and an IPS touchscreen, the Lenovo N22 is a little more advanced than your average Chromebook. Today only though, you’ll only have to pay the bargain basement price of $180. And yes, it will run Android apps. TriggerPoint makes the most popular foam rollers out there, and two different models are on sale today: One for your feet (in two different densities), and one for the rest of you. 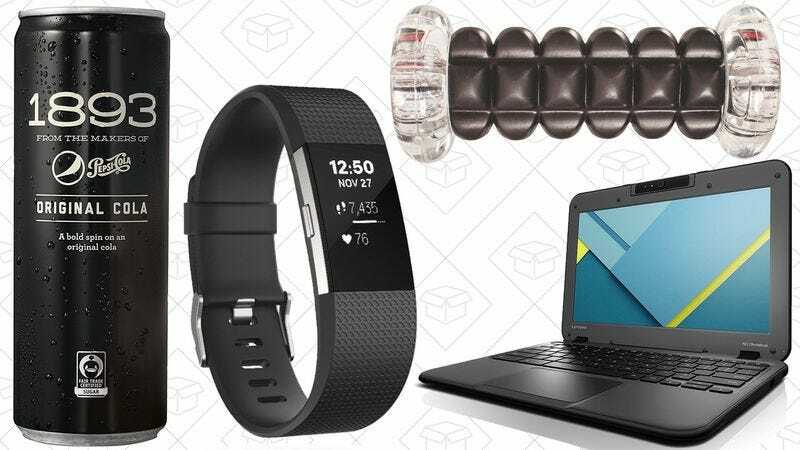 If you missed out on Fitbit’s Black Friday discounts, Amazon’s taking $20 off two of their most popular new trackers. The Fitbit Flex 2 improves on its predecessor with water resistance, swim tracking, colored LEDs, and a smaller design. And for my money, it’s the most attractive fitness tracker I’ve ever seen. Meanwhile, the Charge 2 adds connected GPS (meaning your phone has to be nearby), VO2 max level measuring, and even call & text alerts from your phone. These deals aren’t as good as we saw last month, but if you need a little extra help with your new year’s resolutions, they’re pretty solid. This neck massager may look like a torture device, but let me tell you. I have a similar one from a different brand and it’s fantastic. The weird arm things help you regulate the pressure of the massager and it also heats up. It’s like the best straight jacket you’ve ever worn. People still use pens and paper, who woulda thunk? If you cannot fathom where your pens keep disappearing to and need some replacements, this box of 12 BIC Velocity Bold black ball-point pens is only $5, the lowest it’s ever been. For the rest of Sunday’s best deals, be sure to head over to Kinja Deals.